As population increases, communities become more urbanised and water use increases, it becomes more difficult for traditional water supplies to meet demand. Urbanisation also has environmental impacts on the downstream waterways. More impervious surfaces results in increased total runoff, higher flows and changes to the frequency of flood events and baseflow. 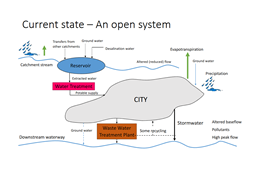 The use of stormwater to supplement a city's water supply has the potential to mitigate both these problems. Additional flow from impervious surfaces can be captured, reducing the downstream impact, and used to supplement the water supply, reducing the reliance on traditional sources of water. It has been claimed that the additional water from the impervious surfaces of a city in a temperate climate is greater than the total water demand of the city, leading to the conclusion that the city could become a 'closed system'. All supply would be provided from rain falling on the urban area, and this will automatically increase as a city grows. Alternative stormwater management is now being practised at the development level, where Water Sensitive Urban Design (WSUD) can minimise downstream impacts and lower potable water requirements. Some stormwater reuse is occurring at the community scale for watering of Public Open Space or 'third pipe' non-potable water supply. However the total use of stormwater remains low, and is estimated to be only 2% of the total water supply. This research is investigating the impacts of extensive use of stormwater. To do this, a case study of Ballarat is being undertaken. Ballarat, a city of approximately 100,000 people in south eastern Australia, faces many issues in common with other cities throughout the world. These include limited local surface and groundwater supplies, increased population, higher demand and climate change. Understanding the impacts on Ballarat can provide understanding to assist other cities facing similar issues. Initial data collection involved historical data from the commencement of the Ballarat Water Board in 1882. It has been proposed that cities undergo similar development stages, but the Ballarat data indicated a different pathway, highlighting that development tends to be a messy business, responding to unique circumstances. The water demand data highlighted that, contrary to expectations, Ballarat water use did not increase throughout the 20th century, but peaked in 1980. The reduction in water use since that time continued through times of high and low availability, and was shown to be driven substantially by a decrease in outside water use, which correlated well with increased pricing. However, pricing had little impact on internal water use which is more dependent on technology, awareness and legislation. The water use in Ballarat is approximately 15% of the downstream river flow. Therefore, if this much additional water is being generated from the impervious surfaces in the city, it may be expected that this could be observed in the river flow information over the past 60 years as the city has expanded. Initial data suggests this is not the case. Current work is focussed on identifying what the impact of urbanisation has been on the total river flow. Future work will then seek to understand other impacts of urbanisation such as peak flows, frequency of flow events and changes to base flow.